We have used our ultraviolet laser (a pulsed dye laser), in addition to a green laser, to ionize a significant fraction of the positronium (Ps) atoms produced by our beamline (read here for more details). 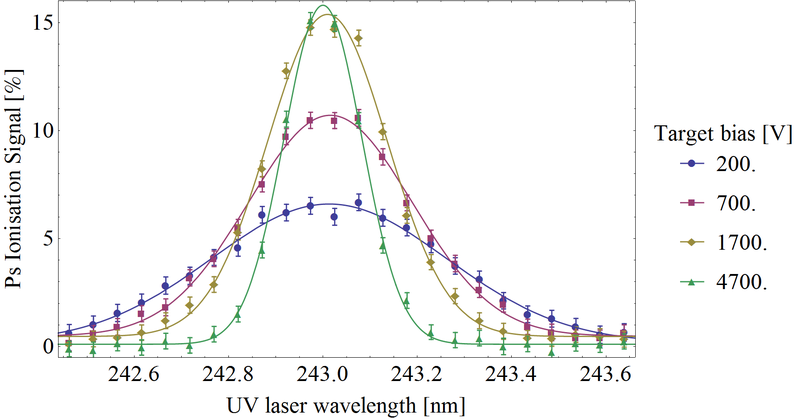 We first tune the UV laser to a wavelength of 243 nm, for which the photons have the same energy as the interval between the ground state and the first excited state of the positronium atom. We carefully time the laser pulse to pass through the cloud of Ps atoms shortly after they’re created, and so many of the atoms absorb the light and become resonantly excited. The photons in the green laser have sufficient energy to then ionise these excited atoms – separating the positron and electron. This technique is known as resonant ionisation spectroscopy (RIS). The positrons are very likely to fall back into the target and annihilate shortly after ionisation occurs, causing more gamma rays to be detected during the prompt peak of our SSPALS traces; with fewer o-Ps annihilations subsequently detected at later times. An example SSPALS trace, with and without the laser, is shown below. 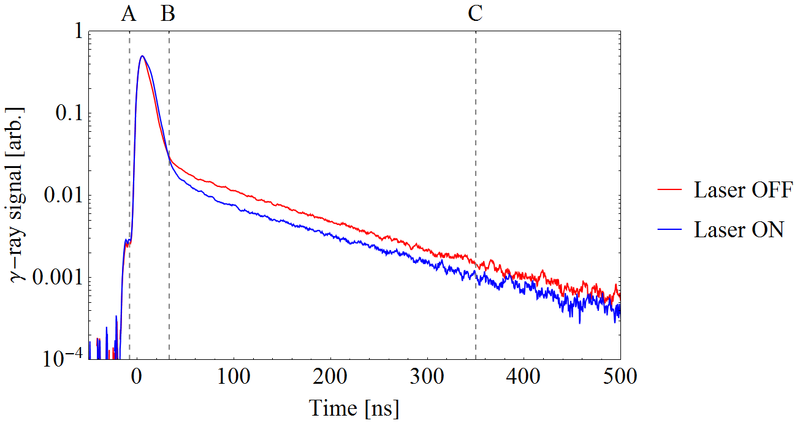 The figure below shows how this ionization signal, S, varies as we tune the UV laser across the resonant wavelength, 243nm, for the 1S-2P transition. The width of the roughly Gaussian line-shape is caused by Doppler broadening, where the atoms moving towards, or away from the laser see a slightly shorter, or longer, wavelength. The different coloured points represent different voltages applied to the Ps converter. This voltage creates an electric field that attracts and accelerates the positrons, implanting them into the material. The highest target bias has the narrowest RIS line-shape as the Ps atoms form deep inside the sample and therefore experience more collisions as they make their way back to the surface, which slows them down and reduces the Doppler effect.